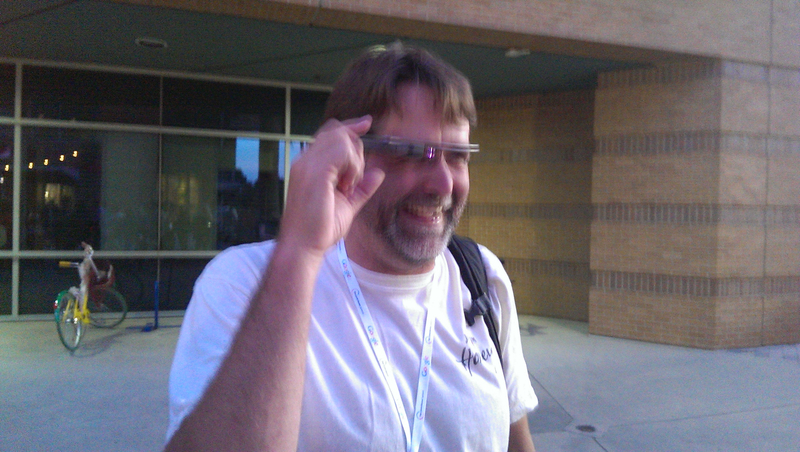 One of my Top Contributor colleagues trying on the Google Glass. There are life opportunities and memories to savour, but we can only imagine the concept of forward time travel. The hanging out experience at the Googleplex yesterday allowed me to connect the past and future. I’ve been here once before (two years ago), and could see just a little about what is ahead in the near future horizon. Specific numbers, data, and certain upcoming program announcements are subject to non-disclosure agreement rules (the trade-off for the NDA is that we can speak much more freely with staff ) but Google Glass is not a secret. The concept of a head-worn computer seems really odd until you try one of these devices on for yourself, and I could do that for just a few minutes. The principle is that if you can free your hands from the computing process, you can then obtain a much more realistic and dynamic view-control of your environment, and capture images and ideas much more effectively. In practice, I expect Glass will find its first practical use in certain medical and industrial settings. Surgeons, for example, could use the tool to supplement/replace conventional operating room monitors and machinists and other equipment operators could obtain immediate visual data/confirmation or maybe even snap photos when required, without much effort. Although a few “explorer” copies have been distributed for a fee to testers/early adaptors, the device isn’t quite ready for prime time. One issue developers are solving is designing the tool so that it can be attached to regular prescription eyeglass frames (necessary since the blurriness for someone with nearsightedness is as bad as you are looking at a real distance). I imagine heavy-duty versions may be needed for construction sites, but equally can see how this tool could be useful for certain trades/supervisors and others trying to juggle a variety of tasks on site. Of course, Google has the money for innovation, and the capacity to push forward big, ambitious projects, that address major issues and require technological ingenuity. This is a Google(x) project.